I like stuff. Well, I like the stuff I like. And if I like it then someone else out there might like it, too… so I thought I might talk about some of it. Equipment, books, training tips, places, and whatever else strikes my fancy and might end up being useful for other mushbabies. This Wednesday’s What I Like is a pretty basic but very important item: The collar tag, an identification tag that does NOT dangle off the collar and therefore is in no danger of getting tangled up with any of the lines when you’re running dogs. When I run both dogs together, I have them in limited slips (which will be the subject of a future WILW) with name and phone number embroidered directly on the collar so there is no need for tags at all. 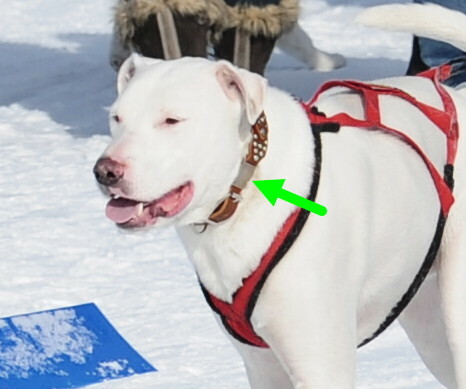 But when I run them individually I might use any one of a number of collars; and since I am a collar junkie, at races I like to use some of Squash’s fancier collars and that is where the collar tags come in. Yes, that small, unobtrusive, and flat tag is perfectly flush with the collar. My favorite source for collar tags is http://www.boomerangtags.com. 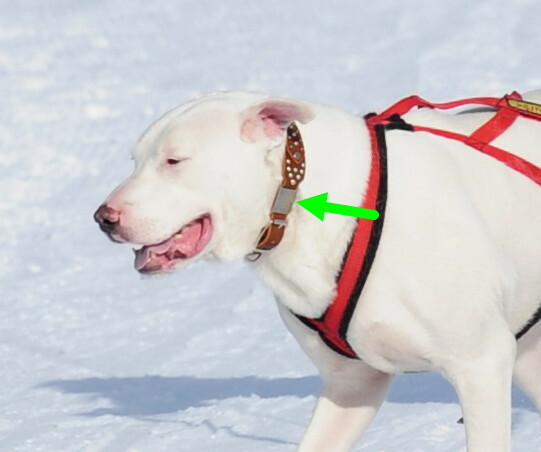 I have found the Boomerang tags well-made, sturdy and they stay very reliably on the collar. The only downside is that they come in a maximum 1″ width which rules out a few of the wider collars in my vast collection (really I have a problem), but it’s really a small sacrifice for safety and peace of mind (and gives me an excuse to buy more 1″ collars!). Even with one dog, there’s the possibility of getting hung up in the line. Or in someone else’s line or anything you might fail at going ON BY. So safety first, mushbabies. Safety first. This entry was posted in Equipment, What I Like Wednesday. Bookmark the permalink. I love Squash! The expressions on the people in the background, watching Squash, are priceless. I’m glad you posted this. We haven’t gotten a tag for Maggie yet, and I like the idea of a tag that won’t get stuck on anything. Thanks! And I’m glad this was useful for you. 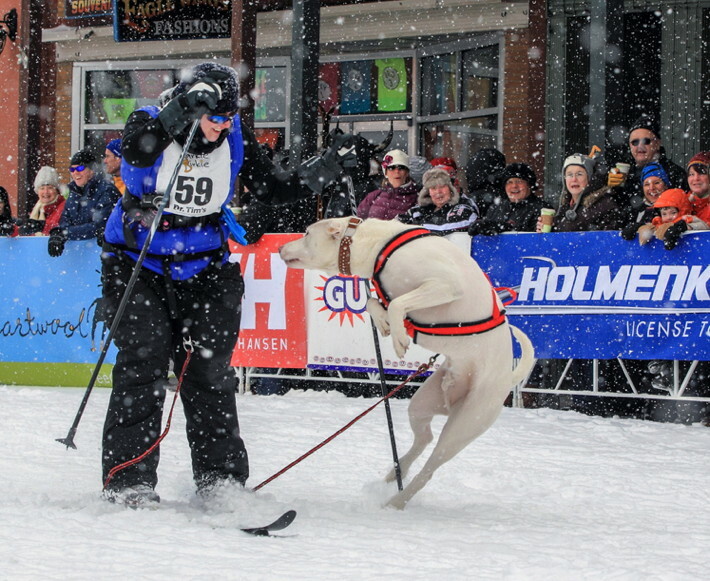 A lot of people have race pictures of their dogs lunging out at full speed, looking all athletic and beautiful slamming into their harnesses, but I LOVE this picture. It’s like… so totally Squash, and I love the looks on the spectator’s faces, too.